Price Range: $550000. - $600000. 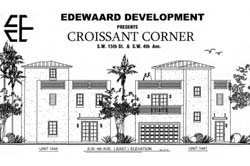 Beautiful townhome built by C. Craig Edewaard located in downtown Ft. Lauderdale. This is an end unit with an optional pool and many high-end finishes. It is located minutes from downtown, the beaches, the airport, and Broward General Hospital. Convenient location for those wanting to be near it all. Buyer selects all finishes and developer will customize townhome to suit buyer. Completion Spring 2008.